The leader of a breakaway faction of the Sri Lankan Tamil Tigers rebel group has been sworn in as a legislator in the country's parliament. Vinayagamoorthi Muralitharan, also known as Colonel Karuna, was appointed as a member of parliament by the ruling United People's Freedom Alliance. His political party, the Tamil Makkal Viduthalai Puligal (TMVP) is allied with the ruling coalition. Col Karuna was a senior rebel commander in eastern Sri Lanka. 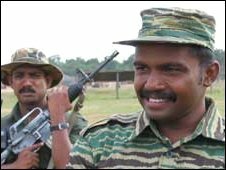 He was effectively number two in the Tamil Tiger military organisation. But in 2004 Col Karuna defected and began fighting alongside government forces against the Tigers. His fighters joined the Sri Lankan government in its offensive against the rebels and helped the security forces to recapture parts of the eastern region from them. "Tamil people can now have the faith of solving their own problems through parliamentary democracy. We should forget the bitter past experiences and work to win the trust of the Tamils," Col Karuna told parliament. Correspondents say that his appointment has already triggered a controversy. The Sinhala nationalist Janata Vimukthi Peramuna party (JVP) has challenged his appointment in the Supreme Court. It argues that the vacancy he took belongs to them because the post became vacant after one of their politicians resigned to take up a provincial post in August. The human rights group, Amnesty International, has also strongly criticised Col Karuna's appointment. The group accuses him of crimes including torture and the use of child soldiers. Col Karuna returned from Britain in July after serving a prison sentence for possessing a false passport. He said his forged diplomatic passport and visa were arranged for him by the Sri Lankan defence secretary.